Oiled pelicans await treatment at the Fort Jackson Oiled Wildlife Rehabilitation Center in Buras, Louisiana. (CNN) -- Long before the brown pelican came to symbolize the tragedy of the Gulf oil spill, the giant bird stood for something much greater: survival against all odds. The state bird of Louisiana was nearly wiped out by pesticides in the 1950s and 1960s. Yet after decades of conservation efforts, the brown pelican just last year was removed from the endangered species list. "At a time when so many species of wildlife are threatened, we once in a while have an opportunity to celebrate an amazing success story," Interior Secretary Ken Salazar declared on November 11. "Today is such a day. The brown pelican is back." Now, eight months later, Louisiana Gov. Bobby Jindal stands on the deck of a boat near Pelican Island off the Louisiana coast. He's surveying efforts to protect the state's wetlands. 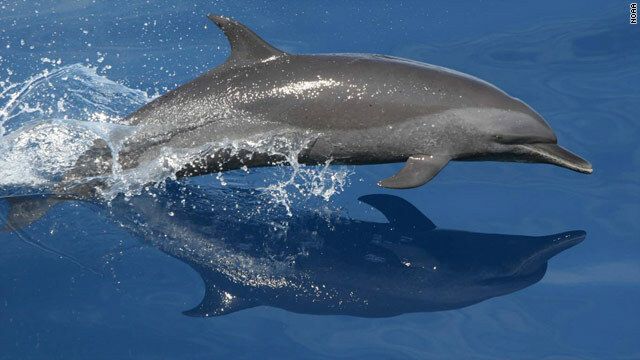 He's ordered the National Guard to begin building barriers in the ocean to try to stop the oil from reaching shore. Yet Jindal pauses to talk about the brown pelican. The recent images of pelicans, coated in BP oil like grotesque statues, have taken on the symbolism of the spill. Louisiana has long been known as the "Pelican State," with the bird gracing the state flag. "Here's what's really sad," Jindal said. "For every one of those mother adult pelicans you're saving, there are many more back there that you can't get to. And for every mother pelican you're saving, there may be a nest, there may be eggs that can't be saved. "And that's the tragedy in this: That for every animal we see, what's this oil doing to their young? What's this oil doing to their life cycles?" The recovery of the pelicans, before the spill, was largely attributed to the ban of the toxic chemical DDT in 1972. The pesticide traveled down the Mississippi River and into the Gulf of Mexico. Three species were most affected: the brown pelican, the bald eagle and peregrine falcon. A component of DDT accumulated in each of those birds and, as a result, it affected the strength of the eggs they laid. "The result was that you had thinner egg shells in the nest. During incubation, all the species had the tendency to break the eggs more easily," said Dr. Doug Inkey, a senior scientist for the National Wildlife Federation. "This resulted in a huge population decline in all three species." The bald eagle, peregrine falcon and brown pelican were all listed on the endangered species list. In the case of the brown pelican, wildlife officials in Louisiana and Florida teamed up to help save the bird over a 13-year period. A total of 1,276 young pelicans were captured in Florida and then released at three sites in southeastern Louisiana, according to the Interior Department. 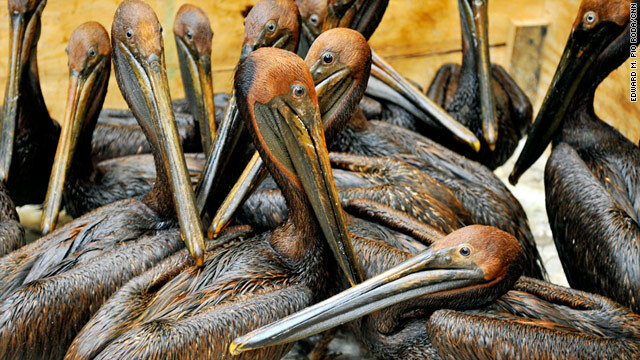 "When their populations were low, we brought in those brown pelicans from Florida," Jindal said. "Now, when we capture them oiled, clean them up and rehabilitate them, we have to release them back in Florida to get away from this oil." Is the oil disaster affecting your area? The U.S. Fish and Wildlife Service has deployed more than 450 people across the Gulf to respond to the nation's worst environmental disaster. As of Monday, the oil threatened 36 National Wildlife Refuges. Nearly 1,200 birds have been saved, including 728 in Louisiana. Ron Britton of the Fish and Wildlife Service gave a CNN crew a tour of the marsh islands near Grand Isle, Louisiana, a prime breeding ground where oiled pelicans have been spotted. "What you're trying to do is get in and get those as quick as you can," Britton told CNN's Anderson Cooper. "But the ones you're missing have less chance each night you can't get back. And the ones we don't get back, we're pretty sure are going somewhere and not surviving." Oil affects pelicans in various ways. The birds' feathers interlock in a way that helps regulate cooling and, when oil soaks their feathers, the birds lose the ability to do that, biologists say. "Brown pelicans dive into the water for fish. As they break the water, that's one of the ways they contact the oil. Then, once it's on their feathers, the birds preen daily," said Jennifer Coulson, president of the Orleans Audubon Society. "When they're preening, they ingest all the BP oil. And so, that's another way they get sick and die." Inkey of the National Wildlife Federation added, "When they get back to their nests, then they rub some of the oil from their chests to their eggs -- and oil on eggs is not a good mix. It's usually deadly for the developing embryo." Inkey recently visited a brown pelican-nesting habitat along the Louisiana coast. Hundreds of the birds lived together in nests about 6 feet high in mangrove trees along the shore. There were two layers of protective booms surrounding the island that were "close to being worthless." "We saw more oil inside the booms than we saw outside the booms," he said. "It was surrounded by a bathtub ring of oil." His first thought: What's going to happen to the pelicans this year? What's this oil doing to their young? What's this oil doing to their life cycles? "This is the worst-case scenario: It's during breeding season," he said. "We're likely to lose a whole generation of young of many different species. ... It only takes once for a bird to really get messed up in oil for it to have an effect on the nesting success." He and other biologists said it's far too early to know the full effect of the oil spill on the larger population of brown pelicans -- and whether the bird would ever make it back to the endangered species list. "It would be premature to suggest that," Inkey said. Biologists said the pelican -- known for its long beak with a hooked tip and its 6-foot wingspan -- is better equipped to survive than smaller birds that ingest oil in greater proportion to their size. In addition, there are five species of sea turtles in the Gulf, and all are endangered or threatened. "A sea turtle hatchling does not stand a chance," Inkey said. Regardless, it's a dire situation for all types of wildlife in the region, biologists said. Yet it was the images of the oil-soaked pelicans that brought home the scope of the disaster -- and its potential devastating consequences. The birds survived DDT, the constant erosion of Louisiana wetlands and Hurricane Katrina. Inkey already had returned from his visit when the photos first appeared. "I got sick in my stomach," he said. "I had seen oiled pelicans, but not like that. The ones I saw were simply gray. These were just heartbreaking." He paused. "How do you explain a picture like that to young children and get them to understand that this is something, although unintentional, that man caused?" CNN's Dugald McConnell and Brian Todd contributed to this report.